We’re busy planning our return trip to Universal Studios, and specifically the Wizarding World of Harry Potter. 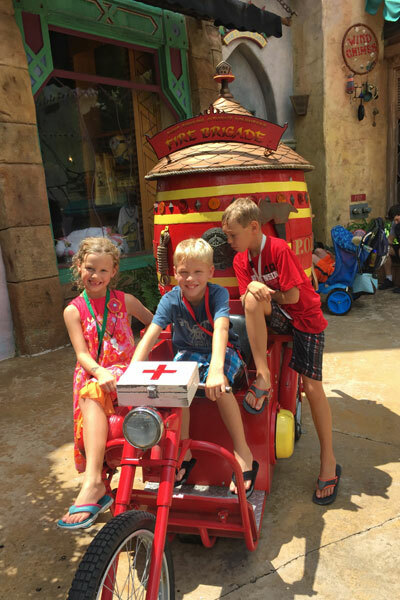 Our kids loved their visit last year; all three even said they preferred Universal in the choice between Disney vs Universal! For those of you planning to visit Universal Studios Orlando, I compiled all of our Universal Studios tips and tricks to make your trip fun, relaxed and affordable. 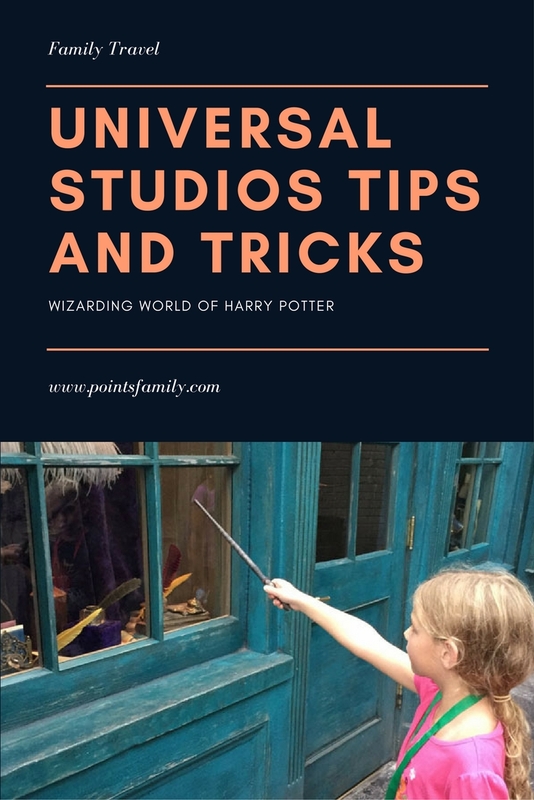 Here are our top tips for taking kids to the Wizarding World of Harry Potter and Universal Studios Orlando. Buy Discount Tickets. You can visit Universal Studios with Discount Tickets to save money. We stacked the discount ticket with travel credits and upgrades to annual passes to score tickets for a family of five. Get Free Express Passes. Express passes at Universal are very convenient, but very expensive. However, Portofino Bay, Hard Rock Hotel and the Royal Pacific On-Site Hotels include free universal express passes! Ride Hogwarts Express with Park-to-Park Tickets. If you want to ride the Hogwarts Express between Universal Studios Florida and Islands of Adventure, you’ll need park-to-park tickets. Riding the train is a highlight if you are going for a Harry Potter themed trip. Use Early Entry for Wizarding World of Harry Potter. When you stay at Universal Studios on-site hotels, you’ll also get early park admission to the Wizarding World of Harry Potter. You can also ride the Escape from Gringotts and the Forbidden Journey during early admission; these two rides do not have express passes. Stop at the Wand Shop First. Our first stop was Ollivander’s wand shop to get a wand. I had planned to just get one wand for the three kids to share! The show is a fun performance, and of course both my boys were chosen to participate (which made convincing them to purchase just one wand a bit harder!) 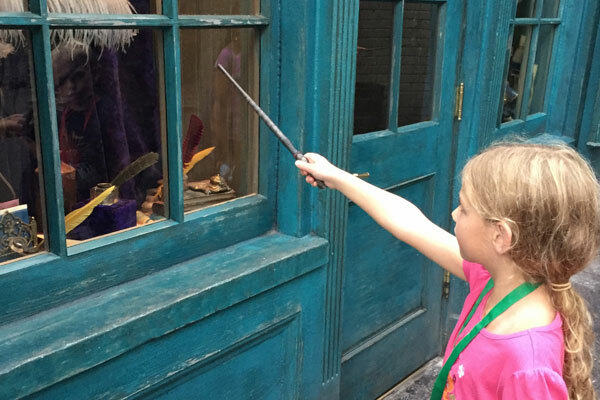 There are interactive wand stations all over the Wizarding World of Harry Potter. There’s a map inside your wand box! Our three kids had no problem taking turns and sharing one wand. In fact, I think it made it more fun because they would actually watch each other. Try all the Butterbeer. 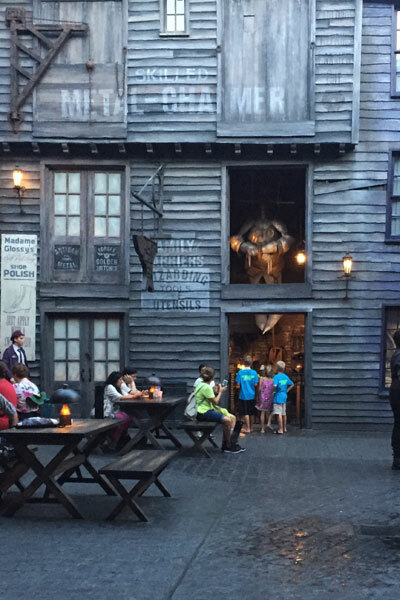 Your visit to Universal will likely revolve around butterbeer. It comes in three forms (regular, frozen and warm) and is not alcoholic. I was skeptical at first, but Butterbeer at Universal Studios will be on our list of must eat snacks when we return! Follow an Easy Touring Plan. We followed the 3 day plan from Orlando Informer. Mostly. Since we had multiple days, if there was ever a longer line than we anticipated, we just skipped it and saved it for another day. Following the easy touring plan meant we didn’t have to plan much in advance! Watch Movies Before Your Trip. Since we were going specifically for Harry Potter, our kids weren’t familiar with many of the other movies or characters before we went. Movies to watch before going: Shrek, Jurassic Park, Men in Black, Cat in the Hat, Transformers, Beetlejuice, Spider-Man, Rocky and Bullwinkle, The Mummy, Blues Brothers, Fantastic Four and Jaws. Not all of these are appropriate for kids, so decide based on the ages of your own children. We also watched a few Simpsons episodes from the first season. Watch featured movies before you go. 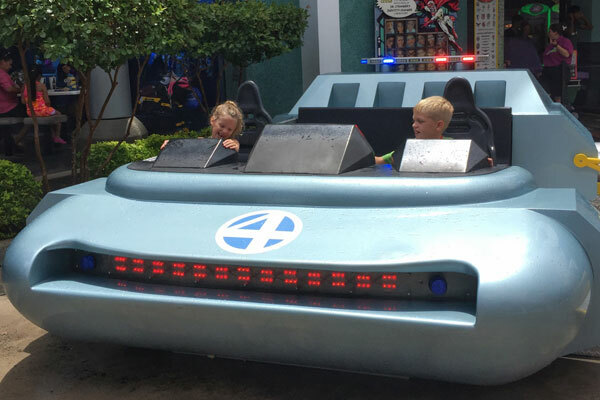 Do they know this is the Fantastic Four car? Pool Hop. When you stay at Universal Studios, you are allowed to visit the other Universal Studios hotels to enjoy the pool. We stayed at the Royal Pacific, but spent an afternoon at the Hard Rock Hotel pool. This year, we are planning to visit the pool and lazy river at the Cabana Bay Beach Resort. Pack Ponchos. We bought a big box of ponchos before we went. They are much cheaper than buying them in the park. We also ordered lanyards ahead of time to save money. Transportation to and from Universal Studios. We rented a car at the Orlando airport and returned it nearby on International Drive. Then we used a quick Uber ride back to the hotel. Crazy, maybe. Dirt cheap? Yes. Dining Discounts. Some of the annual passes include discounts on dining and merchandise. We purchased one annual pass with the benefit, and the dining discount more than made up for the cost of upgrading the pass. Stay Elsewhere at Beginning and End of Trip. We found a great way to maximize the benefits of staying on site, was to book our first and last night elsewhere. You still get the on-site benefits all day on the first and last day of your trip, but without the higher cost of the on-site hotel! We used an award certificate for a free night at the Hyatt Regency Grand Cypress Resort before our stay and stayed at an airport hotel on our last night. Favorite Dining. I’ll expand more in the future on our favorite places to eat at Universal, but our short list of don’t miss restaurants includes Cowfish, Mythos, and The Kitchen. Chicken and waffle sandwiches at the Simpsons and ice cream at Florean Fortescue’s were also a big hit! Harry Potter themed restaurants include Three Broomsticks and the Leaky Cauldron. Our kids all prefer Universal Studios Orlando over Disney! Here’s a list of additional tips that I collected before we went to Universal. We didn’t get a chance to try all of them, so we’ll be working through the rest of the list on our return trip. Ask for the Men in Black immigration tour after your ride. Visit the owl post office in Hogsmead to get your letters postmarked. Use the restrooms in Hogsmead to hear Moaning Mertle. Dial 62442 from the phone in Diagon Alley. Exchange money at the Gringotts bank. Visit the American Express lounge for refreshments. Get free tickets to be in the studio audience for any shows filming on the soundstages. Are you planning a trip to Universal Studios?